A desire of mine has been is to step out of the city onto a piece of land and self sufficiently. I have been making little steps towards this. 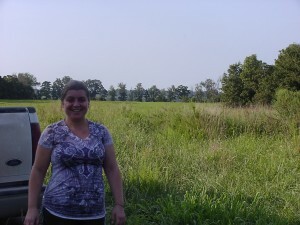 Living in a city in Canada I recieved a call from my mom that she has purchased 12 acres in Missouri. That was the incentive I needed to pick up and live a new adventure. I gave my job at a coffee donut shop two weeks notice. There are two reasons for going to the land; first to gather with a group of like minded beings and a Native American Chief heard about what we wanted to do, his tribe has graciously adopted the small group of us in his tribe and we formed our own clan called the Turtle Clan. With all this in mind we have taken on a huge project here. The things we want to accoplish are growing our own food, off the grid energy, filtering our own water, and living our day to day lives on our terms. The reason why is the monotonous day to day life of working and having to rely on the city for power and water is a way of life we do not want to live anymore. Reasons for that is because we want to take self responsiblity. We also want to teach others who want to learn about this type of lifestyle as. Mom bought our land sight unseen she was living in the guidence of the creator. Many were worried about her choice I believed in her. When we went to visit the land it looked exactly as it was presented. For those looking into buying land I will just say mom did look and make sure the company was reputable and did her homework please make sure you do your homework too if you are planning doing something like this because there are companies out there that are not reputable. The land was used for hay bailing so there was just the land. We drove up to our little gate with a microscopic size sign saying lot 1. We knew we had made a very good decision. There was a mysterious hole dug at the entrance of the property with pieces of metal covering it; no one knew what that was. The grass and weeds were up to our knees in most places and then up to our thighs in other spots. As we were walking through the grass I discovered we have a butterfly patch along the east side of the property towards the woods; everywhere I walked there were purple and white butterflies flying all around me. We also saw beautiful spider webs on the ground between the grasses. When we proceeded into the wooded area which was covered in leaves since it was near the end of August. It felt like a soft floor better than any carpet of soft floor covering. There were many trees which seemed to be mostly healthy except for the walnut trees seemed to be unwell. The further in the trees we went a creek with a tier limestone waterfall. So beautiful to see and it is all ours. I am also excited about being a part of a Native Tribe. This will help to learn about the culture and it is a great project to work together. The Chief has also expressed interest in purchasing his own land and doing a similar project and has asked us to help them and of we will. We would like to not only do this for ourselves, for others as well. With the way the cost of living is constantly going up and up we are looking for ways to help ourselves and others keep the costs down and to live better with the environment. There are lots of things we are doing that is harmful we saw that we can change. This project has been in the works for a long time for those involved we have done things on our own and together collectively as a group. All we want to is a way to live in a way that is healing for the environment we are living in and it is healing also for the beings involved. There have many who have also been inspired to do their own projects and that is encouraged to all to do so. I have lived in Canada my whole life up to this point and I am having the best adventure of my life when I just pack my stuff and came over to the United States. I encourage everyone who has a dream or desire to do something like this to do it; I am having the time of my life.